From mid-April we are exhibiting a unique collection of East Anglian landscapes with a most unusual history. The paintings in this exhibition were almost all created over a period of just two years between 1969 and 1971. The artists who painted them are now well known, but the paintings themselves have never been exhibited before. 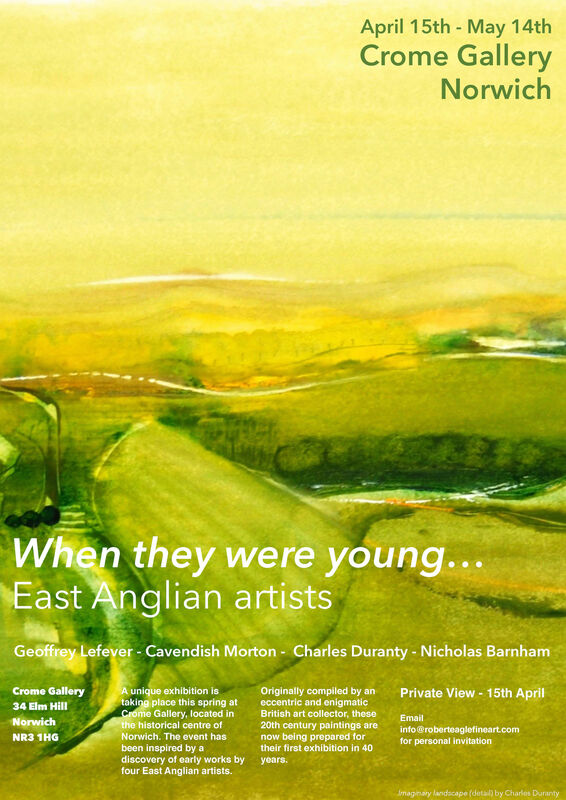 Around 1970 the four artists – Cavendish Morton, Charles Duranty, Geoffrey Lefever and Nicholas Barnham – were all working in their own distinctive styles, inspired by the East Anglian landscape. Morton and Duranty were already quite well established; Lefever and Barnham were just starting their career, and all of them were represented by the Thackeray gallery, which had recently opened in London, specialising in contemporary British art. One of the gallery’s early patrons was an avid maverick collector called Richard Cory Smith. He came from an affluent background, and over a short period he had been building up a substantial collection of British contemporary art. He often bought several pictures at a time, more than he could ever display in his own home. And after acquiring them he fell into the habit of offering them to institutions and government departments, or simply giving them away to friend and acquaintances. This is what happened to the paintings we are exhibiting now. It seems that Cory Smith acquired all of them in the course of just a few visits to the gallery. They weren’t framed or even mounted. Cory Smith bought them, stashed them away in portfolios – and did absolutely nothing with them…. Until about 20 years later when he presented them to a friend, a lady who is now a member of the House of Lords. But she had even less room to display them. So the pictures remained in their portfolios, unseen, all but forgotten, until last year when the lady decided to move house – and asked us if we could do anything with them. While all four artists have made their name in the intervening decades, Richard Cory Smith remains a man of mystery, even to the artists whose work he bought and the people to whom he gave away his pictures. Our research continues, but just about the only thing we know for sure is that Richard Cory Smith died in Crieff, Scotland in 2007, aged 77. Two of the four artists, Geoffrey Lefever and Nicholas Barnham, are still very much active. We are including some of their recent works to compare and contrast with those of four decades ago. We would like to thank Iain Pusey of Crome Gallery for his help in mounting and framing these pictures for their first public exhibition and for the use of his characterful, historic premises at 34 Elm Hill. The image in our poster above is a detail from Green landscape by Charles Duranty.